The Mountains and Rivers Order training schedule cycles through periods of intensification and relaxation, mirroring seasonal changes and giving us varied opportunities to study and practice. The spring and fall quarters are ango (“peaceful dwelling”), ninety-day intensives that continue an ancient tradition dating back to the time of the Buddha, when the sangha gathered in forest groves during monsoon season to support each other in their practice and receive teachings from the Buddha and his senior disciples. Each ango has a theme drawn from the Buddhist teachings. This Fall 2017 Ango, the sangha will be taking on the teachings of Prajna Paramita, the Perfection of Wisdom, one of the foundational teachings of Mahayana Buddhism. We will engage this with selected texts together during the ango’s Buddhist study sessions, art practice and retreats. For more information about this Fall Ango and the various activities both at the Monastery and the Temple, please check out our website. As the year ripens and summer wanes, we come together once again for the fall training period. Shugen Sensei has asked me to be the chief disciple this ango. I’m delighted and deeply grateful for the chance to serve in this fashion. My aspiration for the next few months is to trust unreservedly in the love of the sangha, and not to withhold my love for this life, with its highs and lows, its thorns, its precipices, its peaks, and its abysses. Although I don’t always know how to do that, still, this is my vow. Please guide me in my practice. Throughout the ango, we’ll be studying Prajna Paramita, the Perfection of Wisdom, traditionally personified as the Mother of All Buddhas. We’ll focus in particular on the Perfection of Wisdom in Eight Thousand Lines. As we take up this ancient teaching, let’s embody Prajna through the practices of generosity, discipline, patience, enthusiastic effort, and meditation. In this manner, together with all beings, we give birth to the wisdom that neither arises nor ceases. When Daido Roshi used to visit Fire Lotus Temple, he would often say, It’s because the fire burns that the lotus can bloom. May the fire burn hot—and the lotus bloom—for each of us this fall. Patrick Yunen Kelly, MRO took up formal Zen training in 1994 and began practicing with the MRO in 2000, after moving to New York City from California. He became an MRO student in 2001 and received Jukai from Daido Roshi in 2004. 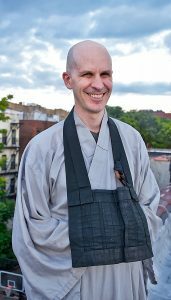 He also completed several years of residential training at Zen Mountain Monastery as well as at the Zen Center of New York City. 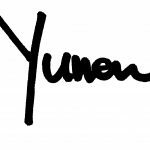 Yunen now lives in Brooklyn with his partner, Constanza Ontaneda, MRO and their two cats, Liza and Tropy. He is currently pursuing a Ph.D. in biochemistry and molecular biology and likes to spend his free time refining his art practice. You can see his work at paintingyunen.com.